This Valentine’s Day, put your heart into the special day with a romance-themed sweet spread. Red, pink, heart-shaped — we’ve got some of the most adorable sweets you could possibly want. Create a fabulous feast at home with these recipes that are enough to set even the most-stoic heart aflutter. 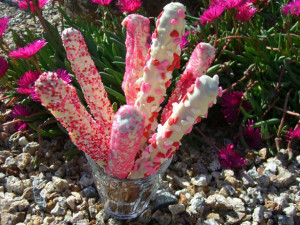 Want to have a little fun with food on Valentine’s Day? Try this one out. Melt you Chocolate chips in the microwave or chocolate melter for as long as it takes to make the chocolate smooth and easy to use. Then using a fork put the pretzel on the fork and dip has much as you feel necessary. Before the chocolate cools sprinkle on your sprinkles, coconut, crushed peacons, etc. Put in fridge for about 10mins to harden. Enjoy! Treat your special someone to a tray full of these sinful little bites. Sieve the flour into a large mixing bowl, add the butter and rub it in using your fingertips until the mixture looks like fine breadcrumbs. Turn the oven on to 200°C/400°F/Gas Mark 6. Dip the cutter in flour then cut out as many circles as you can – you may need to gather the bits of pastry up and roll them out again to make 12 to 18 circles. 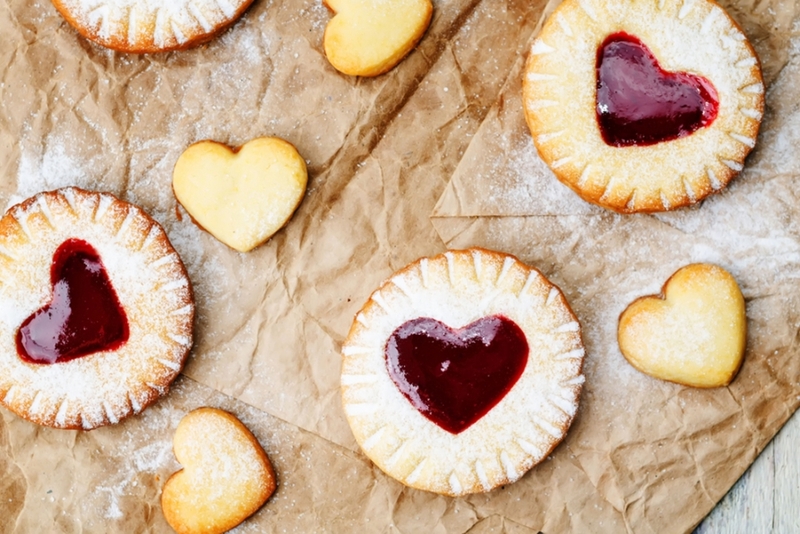 Once you have the desired amount of pastry cases, roll out the pastry scraps and cut out the required amount of hearts, using a mini heart shaped biscuit/cookie cutter. Lay the rounds of pastry in the tart tin, which has been buttered or greased and press them gently into place. Put the tart tray into the oven and bake for 6 minutes until the pastry is very pale golden. 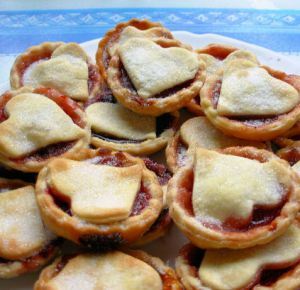 Carefully put 1 heaped teaspoon of jam into each tart, and then top them off with a pastry heart. Leave them to cool for a few minutes then arrange them on an attractive serving plate and sprinkle with caster sugar. Warning: This is sinful. Very, very sinful. Preheat the oven to 350° and position 2 racks in the lower and middle third of the oven. Line 24 muffin cups with paper or foil liners. Put the cocoa powder in a medium heatproof bowl. In a medium bowl, sift the flour with the baking soda, baking powder and salt. In a large bowl, using an electric mixer, beat 1 1/2 sticks of the butter with the granulated sugar until light and fluffy, for about 3 minutes. Beat in the eggs and vanilla, then beat in the dry ingredients in 2 batches, alternating with the cocoa mixture. Bake for 20 to 22 minutes and then let the cupcakes cool in the pans for 5 minutes. In a medium bowl, beat the peanut butter with the remaining 3 tablespoons of butter until creamy. Spoon all but 3 tablespoons of the peanut butter filling into a pastry bag fitted with a 1/4-inch star tip. 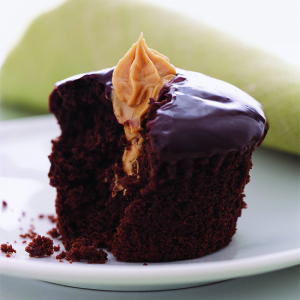 Holding a cupcake in your hand, plunge the tip into the top of the cake, pushing it about 3/4 inch deep. The perfect breakfast dish to mark the beginning of a perfect day. COMBINE flour, morsels, baking powder and salt in large bowl. Combine milk, eggs, oil and brown sugar in medium bowl; add to flour mixture. Stir just until moistened. Put contents into a small pan and place on the MAHARAJA WHITELINE BLAZE INDUCTION COOKTOP on medium heat. 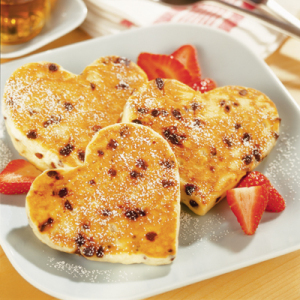 Pour 1/4 cup batter onto hot pan into the shape of a heart; cook until bubbles begin to burst. Turn; continue to cook about 1 minute longer or until golden. Repeat with remaining batter. SPRINKLE with powdered sugar before serving.